By Gordon Frickers 76 x 121 cms (30″ x 48″), sketch in oils scheduled for completion August 2018, available, price upon application. 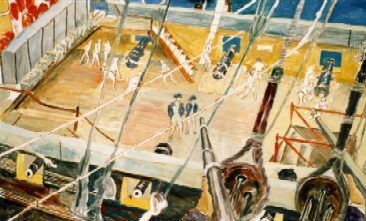 A scene crucial to the story of Nelson, a preparatory sketch in oil for The Nelson and Trafalgar Collection. This painting or rather, full size working study reflects the latest modern research pre 2005. If completed this will have all the attention to colours, action and detail one might expect of a Gordon Frickers painting.